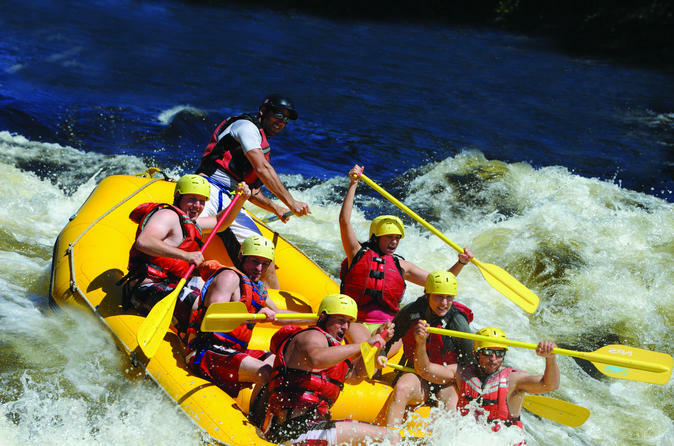 Enjoy an unbeatable one-day adventure rafting down Quebec's tumultuous Rouge River. The Rouge is one of the top whitewater rivers in North America. Draining from the western Laurentian Mountains, it cascades down through the ancient granite of the Canadian Shield. With its impetuous rapids breaking in a cascade of ledges, drops and waves, Rouge promises thrills to novices and veterans alike. Your all-inclusive rafting package includes equipment, a photo and video presentation, lunch, and a delicious salmon or steak dinner. Experience the magnificent Rouge River as you take a trip down one of its two sections in an inflatable boat that accommodates 6 to 10 people. The season usually opens in the Harrington Canyon when the spring flood is at its peak and the water is too high and tumultuous to run the Seven Sisters. The Canyon features a big breaking wave that has been known to occasionally toss 16 feet rafts over at high water levels. It is followed by some other serious events like “Confusion”, “Turbo”, and the “Surprise”. Later from June to October, as the water begins to drop and to warm up considerably, the challenging Seven Sisters Section offers impressive continuous rapids and technical maneuvers all summer long. Your trip will run on the most appropriate section for the water level to ensure you a safe and exciting experience. Your day will begin with a safety briefing. Once in your boat, your professional guide will practice basic rafting maneuvers with you. Before each rapid, he will explain what to do and how to react. One of the Rouge River’s many advantageous characteristics is the calm pools it has at the bottom of every rapid which make for a fun and very safe environment. These calm pools provide an excellent opportunity for you to take in the beautiful landscape of the river and its sandy beaches. At the end of your day one of your guides will host a photo and video presentation featuring your run through some of the biggest rapids complete with plenty of laughs and thrills.